Dancing is a performing art. In every field of the arts there are the hall-of-famers, the role models from last generation, and the current movers-and-shakers. There is also a massive community of performers who are up-and-coming, and then there are those that are just content-to-be-performing, and those that are dance instructors but don’t compete or perform. Swing dancing is a unique performing art because it is SO accessible, one does not have to compete, perform, or teach in order to enjoy the art. Social Dancing is the dominant activity in the WCS community. Because West Coast Swing originated in the first half of this century, very few dancers who were around to witness its birth are still alive. The recorded history of WCS is mostly over the past 50 years. Here we provide a short (and by no means complete) list of who’s who. These are the most common names you will hear in the community, so you know who people are referring to when they mention them. Dance Events will hire the biggest-name professionals they can afford, in order to attract more dancers to attend their event. Most events will invite a mix of “old-school” and “new-school” to relate to every style and generation. Depending on their specialty, these invited professionals will do a mix of teaching workshops, judging contests, and performing or competing. In any local dance community, there are lots of studios and dance instructors where you can take lessons. But if you’re lucky, you may have access to one of the following top-name professionals close to where you live. These are partial lists only! While is it important to value and respect our history, WCS likes to push the envelope and favours those who innovate and evolve. These days it is easy to find the many examples of great current professional WCS dancers from all over the world. You Tube is an excellent source. Be sure to note the date of the video, because WCS evolves with time, like fashion. Beware any videos showing the follower in a skirt – authentic WCS is only danced in pants, and is never referred to as “The West Coast Swing”, simply, “West Coast Swing”. This is the “governing” body for improvised competition (Jack & Jill). Events pay a membership in order to be able to officially record their competition results in the Council’s database. Each competitors’ ranking is determined by points earned and recorded at WSDC recognized events. The database lists all competitors points/rank, as well as serving as a the most complete calendar of events across North America. This is the “governing” body for choreographed competition (Classic & Showcase routines). Select events with a strong standing and high level of competitions are accepted into the association, which sets and shares the industry-standard competition rules. 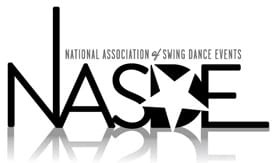 NASDE tracks competitors points earned in Classic and Showcase, and awards aggregate prizes at the end of the competitive circuit, the US Open Swing Dance Championships.